The Quantum Biofeedback program that Larissa Kleuskens uses, called the Indigo, is based in Quantum Physics, or the invisible relationship between matter and energy and the ability to measure those patterns. Through a comprehensive computer program, using the biofeedback principle, biological resonance and reactivity is calculated and energetic stressors of the body are detected. The Indigo is used to scan the electromagnetic frequencies of the body like a virus-scan on a computer. In about 5 minutes the scan detects where the body’s stressors (i.e. pathogens, toxins, nutritional deficiencies, allergies, food sensitivities, hormonal problems, emotional patterns and neurological sensitivities) have created imbalances. The body is checked with over 18,000 frequencies to find where the strongest resonance is found and the highest stressors are identified. Stress on the body can be a result of a large number of factors including but not limited to allergens, bacteria and viruses, chemicals, emotional issues, employment, financial problems, lack of sleep, and pain. The Indigo detects which stressors are most affecting the health of the body. After the Indigo determines the most stressed areas of the body, it then “feeds back” the appropriate healthy frequencies that help the body repair the effects of the stressors. The Indigo has an extremely broad range of applications. People with conditions such as chronic pain, sinusitis, hypoadrenia, hypothyroidism, menstrual disorders, fertility issues, sleep disorders, digestive disorders, anxiety, chronic fatigue, TMJ, diabetes, PTSD and depression (just to name a few) find that using biofeedback to manage their stress and manage their pain helps reduce their symptoms. Through the process of stress reduction the body quite often regains support of the immune system, nervous system, organ systems, and circulatory systems. Being gentle in nature, the Biofeedback frequencies, as well as being effective for adults, are also safe and effective when used for babies, children, and pregnant women. The Indigo device can also be a wonderful preventive program useful in detecting energy imbalances that may lead to disease states later if not corrected. Acupuncture is a key component in Traditional Chinese Medicine (TCM), originating in 100BC in China. Acupuncture’s goal and intent is to activate the natural, self-healing abilities of the body. It also has the ability to strengthen and support the body and prevent illness and invasion of pathogenic factors. Acupuncture is safe, natural and drug-free. Acupuncture uses tiny, disposable, sterile needles placed gently into specific acupuncture points. Acupuncture points are located on meridians through which Qi (chee) our vital energy flows. How does acupuncture work? We have Qi in our body. This Qi is the electrical energy that moves the blood, pumps the heart, and allows the body to perform the millions of activities and functions it does in a day. TCM explains health is the result of a harmonious balance of complementary extremes of yin and yang and qi flow. When life throws obstacles of stress, weather or trauma at us our Qi, yin and yang energies gets disrupted, stagnant, blocked and out of balance. Illness is a consequence of an imbalance of these energies. With acupuncture needles we are able to stimulate acupuncture points to free the flow by removing the blockages of Qi and blood, and create better circulation and balance to the internal organs to activate the bodies self healing abilities. Acupuncturists use a variety of methods to restore balance and maintain health: Acupuncture, Herbs, Moxibustion, Nutrition, Qi Gong, Electro-acupuncture, Tuina/Acupressure, Gua Sha and Acutonics. How many treatments will I need? Each individual is different, depending on age, length of time the condition has been present, and life style factors. It is recommended to have at least 4 to 10 visits. Acutonics is a gentle, non-invasive, deeply relaxing treatment system of vibrational sound healing rooted in Oriental Medicine. This system uses acupuncture points to stimulate qi flow with sound vibrations. The sound and vibrations used to re-harmonize and attune the human energy field to achieve optimal health. The vibrations support the body’s natural frequencies and assist the body in coming into balance. The treatment focus can be physical, emotional, and or spiritual concerns. Far Infrared Sauna uses infrared heaters to emit infrared light experienced as radiant heat which is absorbed by the surface of the skin. Sunlight is a combination of visible light and invisible light. The 7 colors of the rainbow are visible lights. Infrared rays are the healthiest, and penetrate into your skin deeply dissolving harmful substances accumulated in your body. The infrared rays vitalize your cells and metabolism. Far Infrared Saunas are good for: detoxification, relaxation, lower blood pressure, anti-aging and skin purification, cell health, weight loss, pain relief, improve circulation, decrease inflammation, and wound healing. 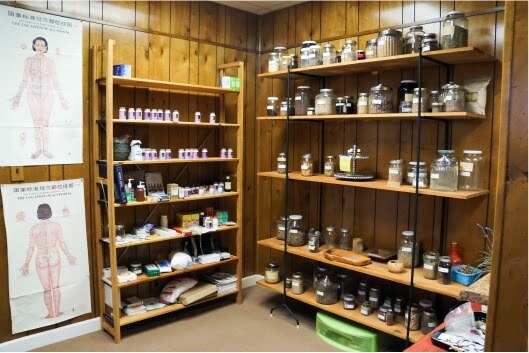 Western herbalism is a holistic form of medicine, and derived from Anglo-American and European traditional healing philosophies and practices. It focuses on the whole person and optimizes health rather than focusing on the symptoms and the disease. Chinese herbal medicine is part of a larger healing system called Traditional Chinese Medicine (TCM). Herbs are prescribed to restore energy balance to the opposing forces of energy. Yin and Yang that run through invisible channels in the body called meridians. Chinese Herbal Medicine treatment is based on TCM diagnosis and has been around for thousands of years. Clearing the ‘energy template’ of the body opens up a true pathway for healing. Many everyday aches and pains, unwanted states of anxiety and high levels of stress, and even chronic illnesses, often have an energetic root cause. Working with SRT allows us to work at the superconscious level of the mind, and offers a precise way to thoroughly research and clear the contents of the subconscious mind, without any need to stir up painful memories. We all run ‘programs’, much like a computer does when you switch it on. Programs are nothing more than our beliefs, perceptions and judgments about life and ourselves. The body is the hardware and all of its hardwired processes are much like a computer’s operating system. How we respond to life and with what emotions we respond with shows us what software programs we are running. Negative programs limit our lives and bring about dysfunctional behavior, while the positive ones bring us the profound ability to move through life with grace, even during stressful times. SRT can help clear the negative programs that are running subconsciously. Mitigate or eliminate phobias, allergies, intolerances etc. Get a clear idea of your purpose and core desires. Many times, people aren’t completely sure what they’re meant to do, or what would make them happy. They have some ideas about things they’d like, but they don’t know how to create real, lasting joy and meaning in their lives. This type of Life Coach helps you to get crystal clear on what you want, what you’re passionate about, and what kind of impact you want to make in the world. Form a concrete, actionable plan, and gives you the secrets to making sure it succeeds. Discover the obstacles that are secretly holding you back. Many of us long to live better, more expanded lives, and to have an impact on those around us. But part of us also clings to the things that are familiar and safe. As you start to move toward the life of your dreams, your old habits, fears and beliefs will rush to try to hold you back, using an amazing array of subtle tactics to protect the status quo. This type of Life Coach helps you to discover these obstacles, even if you’re unable to see them yourself, and form a plan for moving past them so that you can move toward your ideal life full-steam ahead, instead of making slow progress or none at all. Kundalini Yoga is a the yoga of awareness. In Kundalini Yoga we harness the mental, physical, and nervous energies of he body. Kundalini Yoga is a technology that uses breath, mudra, eye-focus, mantra, body locks, and postures to balance the glandular system, strengthen the nervous system, expand lung capacity and purify blood. It brings balance to the body, mind and spirit. KY is a yoga fro householders, for people who have to cope with the daily challenges and stresses of holding jobs, raising families, and managing businesses. It is an amazing tool for everyone who wants the skills to cope with the challenges in today’s world. Qi Gong is a system of meditation in motion or in stillness. It draws and circulates qi, the life force energy, into the body. During this practice love pours into the heart bringing a feeling of well-being and harmony to one’s surroundings. It creates a deep state of inner peace and a feeling of love and harmony with the universe. It opens the heart, strengthens the body and calms the mind. Benefits include inner healing, strengthening, and balancing the mind and body. It heightens instincts and allows one to experience one’s original nature, which is Love. Chakras are Entry Gates of the Aura. Within the physical body resides a spiritual body that contains the Chakras. The word Chakra in Sanscrit translates to wheel or disc. They are centers of activity that receives, assimilates and expresses life force energy. They are responsible for the person’s physical, mental, and spiritual functions. The Seven Main Chakras are located along the central line of the body, from the base of the spine to the top of the head. They are located in the ethereal body and they express the embodiment of spiritual energy on the physical plane. For optimal health, Chakras need to be balanced. Reiki and other energy work modalities can help balance the chakras. Gua Sha is a healing technique used throughout Asia. “Gua” means to rub or friction, and “Sha” is the term used to describe congestion of blood at the surface of the body. When friction is applied in repeated even strokes, the sha surfaces as small red petechiae. In minutes the petechiae fade into echymotic patches. The sha disappears totally in two to four days. The color and rate of fading are both diagnostic and prognostic indicators. The benefits of Gua Sha are numerous. It moves stuck blood, promoting normal circulation to the muscles, tissues, and organs directly beneath the surface treated. Normal metabolic processes are restored by the movement of fluids as nutrients are carried to the tissues and metabolic wastes are carried away. Because Gua Sha mimics sweating, it resolves fever. A care provider considers Gua Sha in any case of pain or discomfort, for upper respiratory or digestive problems, and for any condition where palpitation indicates there is sha. After Gua Sha, the patient is instructed to cover the area, avoiding wind and exposure to the sun or sudden change in temperature. Stretching is recommended but not a heavy workout on the day of the treatment. Cupping is a technique used in Chinese medicine that uses small glass cups as a suction device that is placed on the skin. To create the suction, an alcohol swab is lite with fire and placed in the bottom of the glass cup, then cup is placed on the skin. The superficial muscle layer is pulled upward into the cup. Once suction has occurred it can be left in that area or gently moved, often referred to as gliding cupping. Cupping can be relaxing and targets acupuncture points as well as painful body parts. READY TO GET STARTED? SEE OUR PRICING & PAPERWORK.